Our 540511 ALL 316L Stainless Mercury header is basically the same as our 540504 ALL 316L Stainless Mercury header except for the overall width, which is 33". Designed with a narrow overall width for tight motor box configurations or for twin engines applications. A short or angled valve cover must be used. This header must be removed to adjust valves. 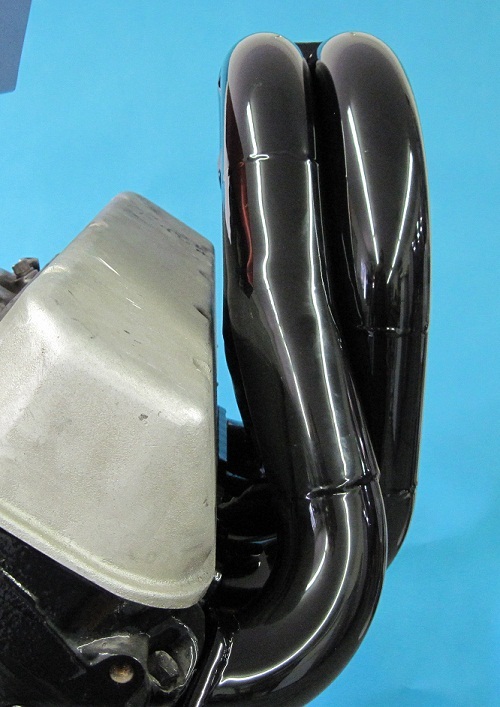 This header incorporates a 2" primary tube (1 7/8" I.D.) The 2" primary tube header has been Dyno tested with our 632 cubic inch Chevy test engine with outstanding results. For more info click here. The standard collector length is 8" and points down at approx. 14 degrees. This Header runs aft approximately 12" further than the stock manifold so it is important to measure the boat. The header will be approximately 5" from touching the exhaust tip on the starboard side and 8" on the port side. Keep in mind, that if the exhaust tips are below the water line, the header can literally pull water up from outside the boat.